"An Evening with Martin Hayes & Dennis Cahill"
BYOB Beer and Wine as always! Martin Hayes is regarded as one of the most extraordinary talents to emerge in the world of Irish traditional music. His unique sound, his mastery of his chosen instrument – the violin – his acknowledgement of the past and his shaping of the future of the music, combine to create an astonishing and formidable artistic intelligence. He is the recipient of major national and international awards: most recently the prestigious Gradam Ceoil, Musician of the Year 2008 from the Irish language television station TG 4; previously Man of the Year from the American Irish Historical Society; Folk Instrumentalist of the Year from BBC Radio; a National Entertainment Award (the Irish ‘Grammy’); six All-Ireland fiddle championships - before the age of nineteen - and cited by the Irish Sunday Tribune as one of the hundred most influential Irish men and women in the fields of entertainment, politics and sports in the year 2000, as well as one of the most important musicians to come out of Ireland in the last fifty years. Dennis Cahill is a master guitarist, a native of Chicago born to parents from the Dingle Peninsula in County Kerry, Ireland. He studied at the city’s prestigious Music College before becoming an active member of the local music scene. Cahill’s spare, essential accompaniment to Martin Hayes’ fiddle is acknowledged as a major breakthrough for guitar in the Irish tradition. In addition to his work with Martin, Dennis has performed with such renowned fiddlers as Liz Carroll, Eileen Ivers and Kevin Burke, as well as many Irish musicians on both sides of the Atlantic. 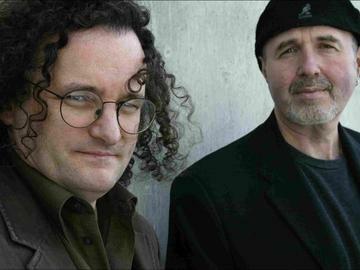 Martin Hayes and Dennis Cahill met in Chicago in the 1980s. They formed the jazz/rock/fusion band, Midnight Court, which allowed them to experiment with a variety of new music styles. When Martin reclaimed his traditional roots, reinvigorated, and after recording two solo albums, he began a new musical relationship with Cahill, beginning with the lyrical music of East Clare. They played long, sometimes thirty-minute, multi-tune sets in their concerts, starting from the simplest of melodies, building in intensity, but never abandoning musicality and ideas. Their touring schedule takes them to Australia, Japan, throughout Europe, the U.K. and Ireland, as well as the United States and Canada. They have also performed in Hong Kong, Beijing, Shanghai as well as Warsaw and Mexico City. In 1997 they released their first duet album, “The Lonesome Touch”, followed by “Live in Seattle” in 1999. After a ten-year hiatus, in February 2008, Martin Hayes and Dennis Cahill released the studio album “Welcome Here Again.” All are available on the Green Linnet label through Compass Records.